Adrian and Ron Scamp have been named one of the 2019 RHS Master Growers. The scheme celebrates the work of the most impressive nurseries and growers in the UK and a special exhibition and display will be a highlight of the RHS Flower show at Cardiff on the 12-14 April. The nursery, founded by Ron in 1991 is 4-4.8ha (10-12 acres) so not big compared to some bulb growers. 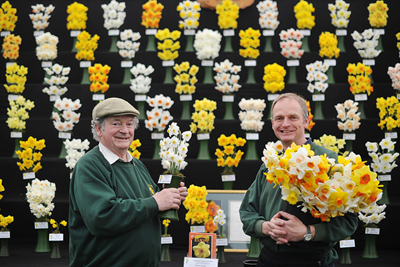 Son Adrian is continuing the tradition of growing specialist flowers, many of which would not otherwise be seen including daffodils bred by Ron over the past 40 years.